The robotics industry is growing at a compound annual growth rate of 17%, and it is predicted that worldwide spending on robotics will rise to $135 billion by 2019. The two biggest manufacturing sectors that purchase robots are automotive and electronics, industries that mass-produce items with lots of separate components that need to be assembled accurately. Other industries such as healthcare are also quickly adopting robots into their workflow. One area where robots do not have a large presence is in the food industry. Even though the market value of robotics in the food industry is expected to rise from $1.3 billion currently to $2.5 billion by 2022, that’s still only less than 2% of the total worldwide spending on robotics. The challenge in integrating robotics into the food industry stems from the fact that the raw materials coming into the pipeline may not have standard dimensions that can be programmed into a robot. For example, a robot designed to attach a car door can be easily programmed to take into account the dimensions of a car door because those dimensions remain constant for a particular car type. However, a robot designed to peel an apple is more challenging to program because no two apples have the same dimensions. The benefits of using robots in food processing are attractive, however. Robots can achieve consistent results more quickly than human employees can. Health and safety issues are also less of a problem with robots that can be designed to handle extreme conditions such as high temperatures. 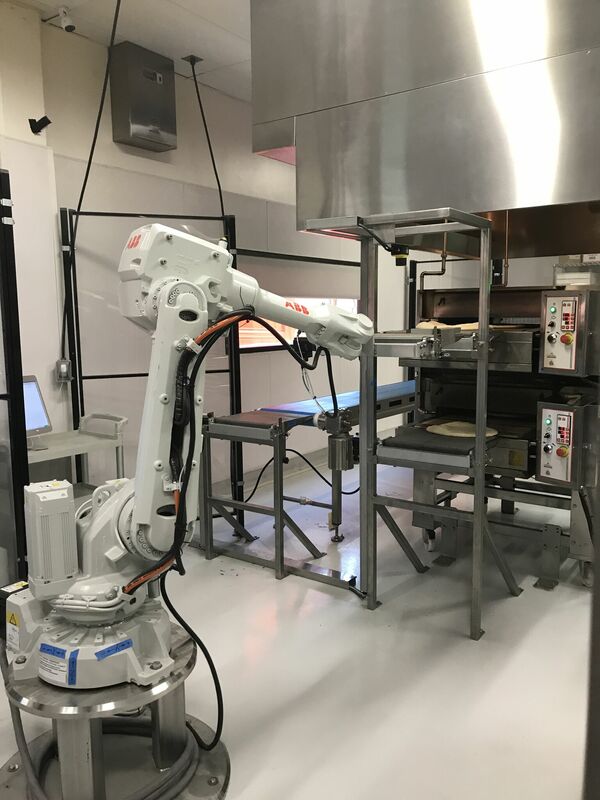 Especially in repetitive processes like cake decorating or chicken deboning, robots can help lower the cost of production through producing higher yields with no need for training or breaks. Food processing can be divided into two steps: primary processing and secondary processing. In primary food processing, raw materials are extracted or transformed into food commodities. An example of such a process is milling wheat. In secondary food processing, these food commodities are then turned into edible products. Robots are slowly being integrated into both steps with varying levels of success due to the varying levels of uniformity in the raw materials that each step starts with. In primary food processing, raw plant and animal products are extracted into commodities that can either go into secondary processing or be sold as-is. Because raw products have inconsistent dimensions, robots that require programming a default set of dimensions might not be well-suited to the task. One process where robots have successfully been integrated is in chicken leg deboning. The dimensions of a chicken leg have small variations, so many companies have developed an assembly-line system that can break down a piece of chicken leg into separate parts. Many of these machines can debone 100 pieces of chicken legs per minute which means they are much more efficient than humans can ever be. With the growing popularity of chicken legs worldwide, the poultry industry has been able to keep up partly because of the widespread use of these machines. Beef butchery, on the other hand, is a process that robots cannot yet handle on their own. Beef carcasses are much more varied in shape and size than chicken legs, and human butchers rely on touch more than sight when butchering beef. JBS, a meat processing company based in Brazil, is investing in Scott Technology, a New Zealand robotics company, to build different robots that can together break down a beef carcass. One robot is programmed to create a 3D model of each beef carcass for the robotic arms to use as a reference point when cutting out different sections of the beef. The process would also include robots designed to sort and package each cut. In secondary food processing, food commodities are turned into edible food products. Because the raw materials in this process have already gone through primary food processing, there is more consistency in their dimensions and processes are easier to automate. Many secondary food processes also require high attention to detail, which robots excel at. A good example of this is cake decorating. Mass-produced cakes have the same dimensions and similar decorations on them, so a robot can very easily be programmed to put icing on cakes in a specific configuration. Some robots even allow humans to input custom designs to draw onto each cake into their controllers. This opens up the opportunity to consistently create complex patterns that a human cake decorator may take a long time to produce. Pizza-making is another area where robots are looking to enter. Pizzas require frequent rotations in an oven, which may be dangerous for human workers especially if high production numbers are needed. Zume, a US-based startup, is designing some robots that can assist in the “low-level” tasks involved in pizza-making such as dough-mixing and in-oven rotating. This could free up human workers to focus on creating novel topping and sauce combinations and create a safer working environment where they don’t have to stick their arms into an oven to rotate pizzas. A challenge in secondary food processing is making sure human workers can keep up with the robots they work with. CaliBurger, a US-based burger restaurant, deployed a burger-flipping robot called Flippy that was decommissioned only a day later because human employees couldn’t keep up with the number of burger patties Flippy was cooking. This isn’t as much of an issue in factory lines where products are released in batches, but human employees can be overwhelmed in restaurants where orders need to be made and pushed out to customers as they are received. The challenges faced by the different sectors of the food industry depend largely on the raw materials into each sector and whether products need to be delivered continuously or in batches of shipments. Giving robots the ability to assess each individual raw material before treatment may be key in primary processes, whereas training human employees to work alongside robots may be a bigger issue in secondary processes. As a whole, the food industry needs to confront not only where robots could be a beneficial investment but also how to transition its human employees out of the roles robots are taking over. Featured image courtesy of Zume. If you have any questions or would like to know if we can help you with your innovation challenge, please contact our Food & Beverage lead, Corey Katz at ckatz@prescouter.com. Natasha Jane Chrisandina is a master’s student in chemical engineering at the Georgia Institute of Technology, where she works on designing a process for lignin extraction prior to pulping. Prior to this, she worked as an undergraduate researcher in the area of lignin depolymerization and co-authored a publication on Catalysis Today. She is also passionate about communicating science to the general public, and runs a blog discussing recent developments in health, technology, and the environment.